Modulation of ionic current flowing through nanoscale pores is one of the fundamental biological processes. Inspired by nature, nanopores in synthetic solid-state membranes are being developed to enable rapid analysis of biological macromolecules and to serve as elements of nanofludic circuits. Here, we theoretically investigate ion and water transport through a graphene-insulator-graphene membrane containing a single, electrolyte-filled nanopore. By means of all-atom molecular dynamics simulations we show that the charge state of such a graphene nanopore capacitor can regulate both the selectivity and the magnitude of the nanopore ionic current. At a fixed transmembrane bias, the ionic current can be switched from being carried by an equal mixture of cations and anions to being carried almost exclusively by either cationic or anionic species, depending on the the sign of the charge assigned to both plates of the capacitor. Assigning the plates of the capacitor opposite sign charges can either increase the nanopore current or reduce it substantially, depending on the polarity of the bias driving the transmembrane current. 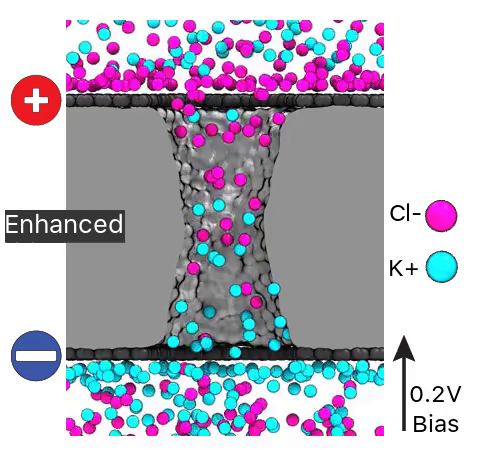 Facilitated by dynamic inversion of the nanopore surface charge, such ionic current modulations are found to occur despite the physical dimensions of the nanopore being an order of magnitude larger than the screening length of the electrolyte. 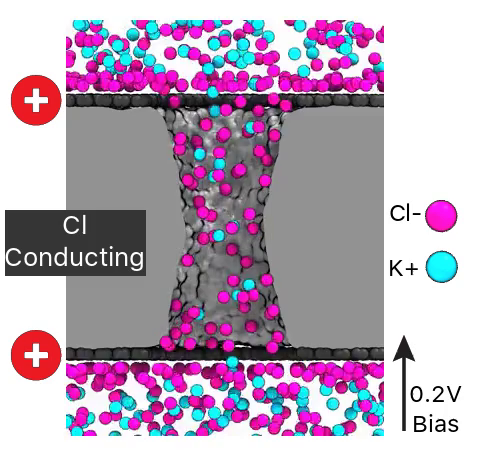 The ionic current rectification is accompanied by a pronounced electro-osmotic effect that can transport neutral molecules such as proteins and drugs across the solid-state membrane and thereby serve as an interface between electronic and chemical signals. A molecular dynamics simulation of Ion transport through a baseline (uncharged) graphene nanopore capacitor with an applied transmembrane bias of 200 mV. The graphene nanopore capacitor consists of an insulator, silica, sandwiched between single-layer graphene sheets. The graphene nanopore capacitor is submerged in a 1.1M KCl electrolyte solution. 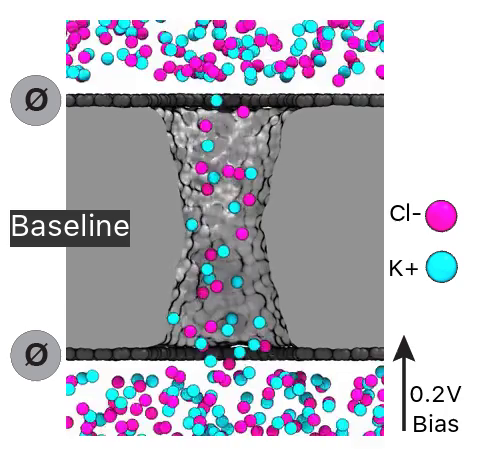 In the movie, the nanopore capacitor is shown in a cut-away representation, dark grey spheres represent carbon atoms comprising the graphene plates, a light gray surface represents the silica membrane, and purple and light blue spheres represent Cl− and K+ ions, respectively. The top and bottom graphene layers are electrically neutral (σtop = σbottom = 0 e nm−2), which is schematically indicated by the dark grey circles. This animation shows the last 5 ns of the respective 25 ns MD trajectory. Ion transport through a K+ conducting graphene nanopore capacitor with an applied transmembrane bias of 200 mV. 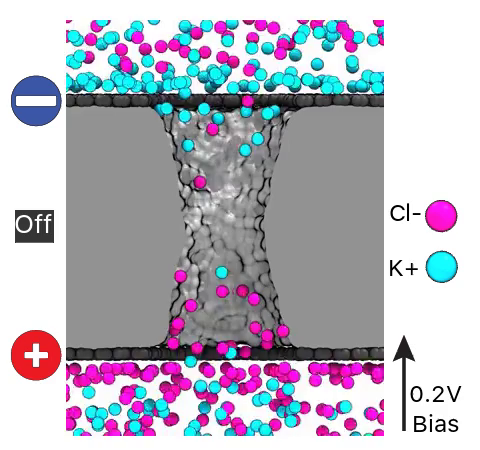 The nanopore capacitor is shown in a cut-away representation, dark grey spheres represent carbon atoms comprising the graphene plates, a light gray surface represents the silica membrane, and purple and light blue spheres represent Cl− and K+ ions, respectively. The top and bottom graphene plates are negatively charged to σbottom = σtop = −2.0 e nm−2 which is schematically illustrated by the blue circles. This animation shows the last 5 ns of the respective 25 ns MD trajectory. Ion transport through a Cl− conducting graphene nanopore capacitor with an applied transmembrane bias of 200 mV. The nanopore capacitor is shown in a cut-away representation, dark grey spheres represent carbon atoms comprising the graphene plates, a light gray surface represents the silica membrane, and purple and light blue spheres represent Cl− and K+ ions, respectively. The top and bottom graphene plates are positively charged to σbottom = σtop = −2.0 e nm−2 which is schematically illustrated by the red circles. This animation shows the last 5 ns of the respective 25 ns MD trajectory. Ion transport through an enhanced graphene nanopore capacitor with an applied transmembrane bias of 200 mV. 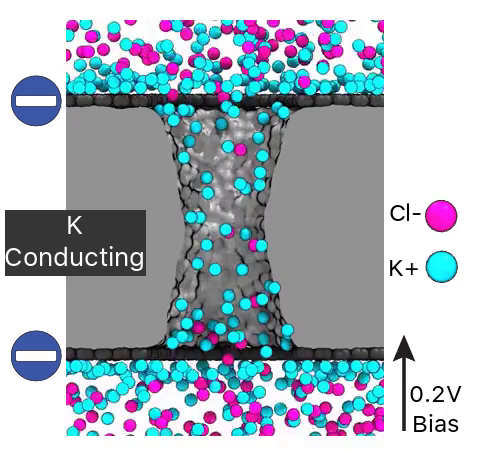 The nanopore capacitor is shown in a cut-away representation, dark grey spheres represent carbon atoms comprising the graphene plates, a light gray surface represents the silica membrane, and purple and light blue spheres represent Cl− and K+ ions, respectively. The top and bottom graphene plates are oppositely charged: σtop = +2.0 e nm−2 and σbottom = −2.0 e nm−2 which is illustrated by the red and blue circles This animation shows the last 5 ns of the respective 25 ns MD trajectory. Ion transport through an off-state graphene nanopore capacitor with an applied transmembrane bias of 200 mV. The nanopore capacitor is shown in a cut-away representation, dark grey spheres represent carbon atoms comprising the graphene plates, a light gray surface represents the silica membrane, and purple and light blue spheres represent Cl− and K+ ions, respectively. The top and bottom graphene plates are oppositely charged: σtop = −2.0 e nm−2 and σbottom = 2.0 e nm−2 which is illustrated by the blue and red circles This animation shows the last 5 ns of the respective 25 ns MD trajectory.